Photos taken the CCRC Fall Banquet on October 23, 2014. Photos courtesy of Anita Lahr and Bob Fitzsimmons. Photos taken at the Women for Glenn Thompson meeting on Monday October 20, 2014 in DuBois, PA. Photos courtesy of Anita Lahr. Missing from the photos are Nancy Banner and Gwen Pfaff-Wills. 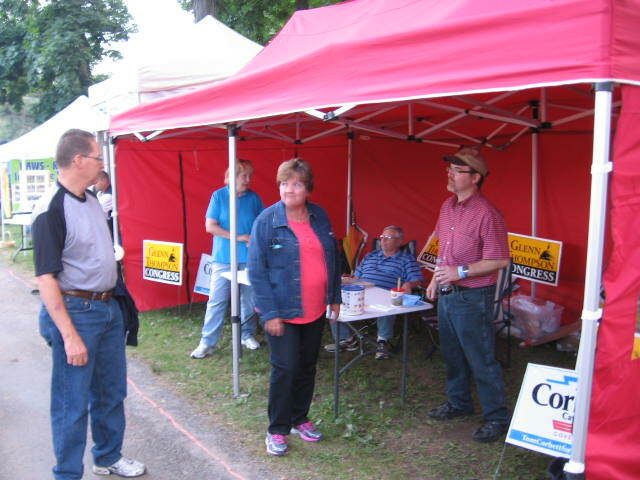 Photos taken at the 2014 Clarion County Republican Committee Picnic on Thursday September 4th at the Clarion County Park. Photos courtesy of Bob Fitzsimmons. Photos taken at the CCRC Spring Breakfast. The attendees enjoyed listening to U.S Congressman Mike Kelly, U.S Congressman Glenn "GT" Thompson and PA Representative Donna Oberlander. The keynote speaker Jim Roddy encouraged the Clarion County grassroots leaders to keep up the good work that they were doing. Photos taken at the CCRC phone banks and of volunteers that did door to door contacts in the communities. Photos courtesy of Anita Lahr. Photos taken at the CCRC ALF Breakfast hosted at 6th & Main Market and the CCRC parade entries & the military float sponsored by the CCRC. Some photos courtesy of Brenda Ciancio. Photos taken at the 2014 Clarion County Fair. Volunteers sharing literature and discussing issues with people visiting the booth. Photos from the Team GT 2014 Bus Tour of the Fifth District. The St. Valentines Day decorations were up, and excitement was in the air as Congressman "GT" Thompson met with friends and supporters at Captain Loomis Restaurant, in beautiful downtown Clarion on Jan. 24! Photos taken at the 2013 60th Autumn Leaf Festival Parade on Saturday September 28, 2013.